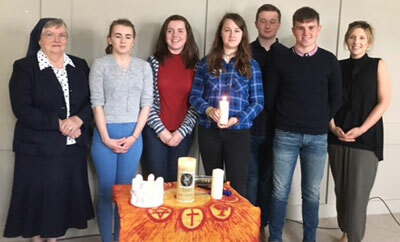 Congratulations to Ciara Dolan, Andrea Delaney, Lauren King, Dean Connell and Ethan Roche who were recently commissioned as Meitheal leaders at a ceremony in Esker. They have undergone training in leadership and will now bring their skills back to the school and become advocates of peace, justice and compassion among the student body. They are photographed with Sr Assumpta and Ms Ruth Conroy.